(1) Gorrell, et al., Stator-Rotor Interactions in a Transonic Compressor Part 1: Effect of Blade-Row Spacing on Performance, Transaction of ASME, Journal of Turbomachinery, Vol.125 (2003), pp.328-335. 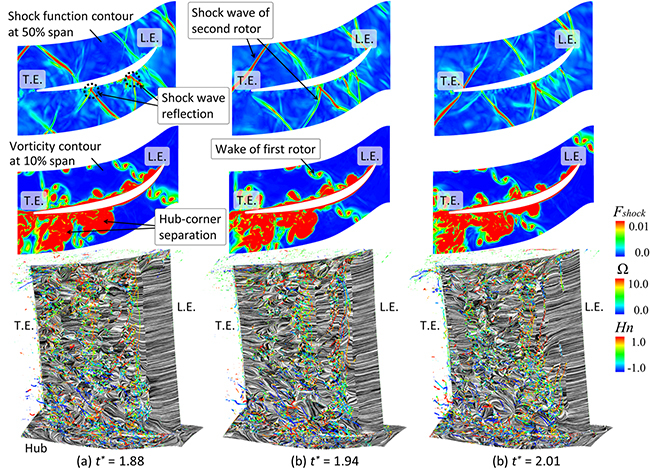 (2) Gorrell, et al., Stator-Rotor Interactions in a Transonic Compressor Part 2: Description of a Loss-Producing Mechanism, Transaction of ASME, Journal of Turbomachinery, Vol.125 (2003), pp.336-345. (3) Strelets, M., Detached Eddy Simulation of Massively Separated Flows, In Proceedings of 29th Fluid Dynamic Conference, AIAA PaperNo.2001-0879 (2001). 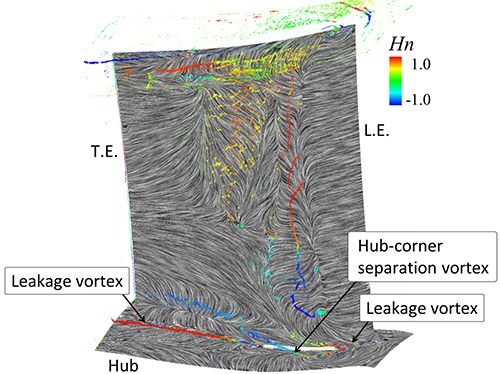 (4) Nicoud, F., Ducros, F., Subgrid-Scale Stress Modelling Based on the Square of the Velocity Gradient Tensor, Flow Turbulence and Combustion, Vol.62, No.3 (1999), pp.183-200. (5) Shima, E. and Kitamura, K., Parameter-Free Simple Low-Dissipation AUSM-Family Scheme for All Speeds, AIAA Journal, Vol.49, No.8 (2011), pp.1693-1709. (6) Anderson, W. K., Thomas, J. L. and Van Leer, B., Comparison of Finite Volume Flux Vector Splittings for the Euler Equations, AIAA Journal, Vol.24, No.9 (1986), pp.1453-1460. (8) Wilcox, D.C., Simulation of Transition with a Two-Equation Turbulence Model, AIAA Journal, Vol.32, No.2 (1994), pp.247-255. (9) 古川雅人, ターボ機械における流動現象の知的可視化, 可視化情報学会誌, Vol.23, No.91 (2003), pp.206-213.